Anchors in Time is an exquisite jewel box of a show: a single large room containing selections from five decades of Dominic Di Mare’s long and extraordinarily productive career. This presentation of 35 works in multiple mediums offers a rare opportunity to see how a visual language of personal references connects different stages of a long career. Di Mare’s sculptures, made from knotted linen thread, wood, beads, clay, paper and horsehair, predominate. 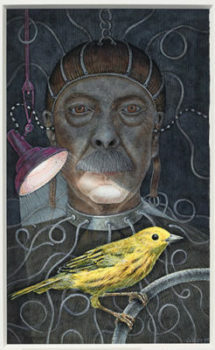 But there are also surreal watercolor self-portraits, intricately cut artist’s books and re-interpretations of Old Master paintings that are simultaneously visionary and schematic. Although some of these bodies of work are presented together — the self-portraits and a case of the artist’s books, for example — the sculptural works appear throughout the space, and are placed according to aesthetic considerations rather than chronological ones. This approach highlights Di Mare’s extraordinary facility with materials and formal invention. Born in 1932 into a Sicilian-American fishing family in Monterey, Di Mare spent his childhood in a grueling combination of work and school that was once common in many families, particularly during the Depression. From an early age he helped out, whether making or mending equipment or by accompanying his father out on the water– a dangerous and unpredictable enterprise (his uncle was lost at sea while trolling for salmon). As the oldest son, Di Mare was expected to continue in the family business, but he had other plans. Having showed early promise as an artist, winning awards and attending a summer session at CCA on a scholarship while in high school, he made the momentous decision to continue with art. After a stint in the army, he received a degree from San Francisco State University. 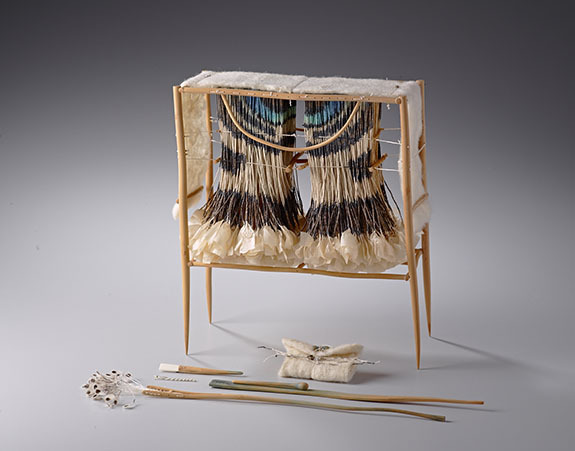 When Di Mare started teaching junior high school in 1960, weaving was part of the required art curriculum. He’d taken a class while obtaining his teaching credential, but Craft Horizons magazine was his real window onto the wider art world. 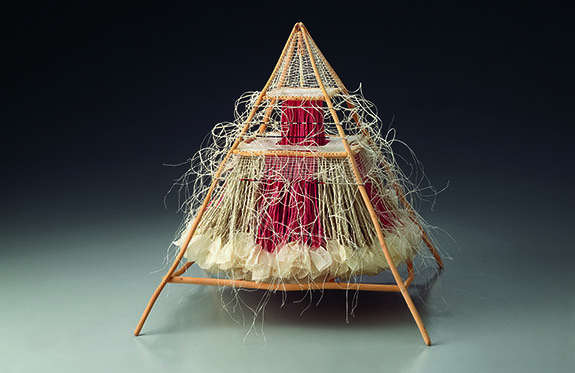 Fiber art was then moving off the loom into multidimensional wall pieces, and Di Mare’s own experiments with weaving soon achieved national attention, including his first one-person show at the Museum of Contemporary Crafts in New York in 1964. 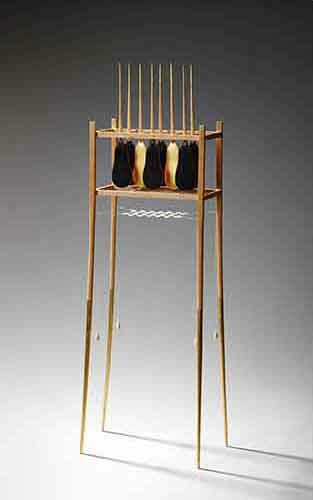 Surprising everyone, he soon put weaving aside, which may be why none of this early work is included in this exhibition. Instead, his first show at Anneberg Gallery in San Francisco in 1973 consisted of sculpture that incorporated handmade paper, clay, wood, knotted thread and feathers. From the late 1960s through the early aughts, Di Mare continued working with these materials, making the exquisitely crafted sculpture for which he has become widely known and celebrated– thanks, in part, to a resurgence of interest in crafts of all kinds, including tribal and folk art. Di Mare’s work—coming from what the show’s curator, Signe Mayfield, calls the artist’s “personal wellspring” of experience—both fits within these cultural trends and stands apart from them. 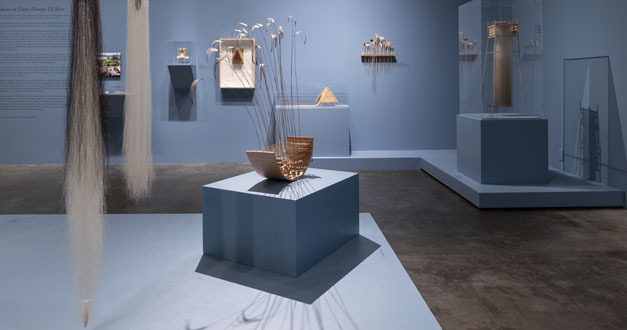 Di Mare drew not only from his own fishing experience and connection to the sea, but also from memories of his parents patiently fashioning materials into useful, beautiful things: his father’s fishing nets and lures, his mother’s crocheting and lacemaking. sometimes fetish-like qualities suggest devotional or spiritual practices, a reading supported by the fact that the full title of each includes a date referring to a significant year in the artist’s life. Titles of other series and works (e.g. Rune Bundle and Temple) also allude to spiritual/magical matters, while still other works suggest what Mayfield describes as “implements for protection, ritual or survival,” like the exquisite oars in Confessional/ Paddle from 1999. 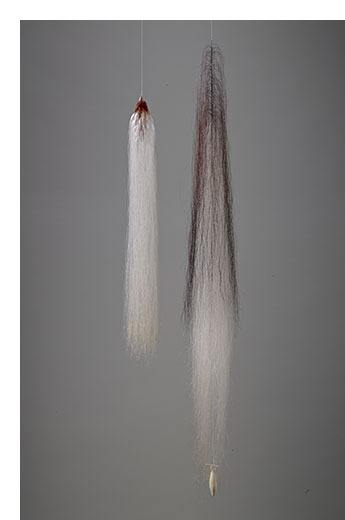 In sculptures from the 1980s, especially the Mourning Station series, soft cascades of horsehair evoke flowing water as well as femininity — an acknowledgment, perhaps, of Di Mare’s mother’s influence. Sometimes, the soft curtain of hair hides family photographs, secrets visible only to the works’ owners. art-making or a connection to nature. Like the surrealist self portraits of Frida Kahlo, these are unsparingly, accurately observed– though is some ways, they are more closely related to Salvador Dali’s wry self- observations: startling, humorous and downright strange. In Di Mare’s penultimate series, the Reconstructions, the artist uses abstraction to investigate the underlying structure of great works of figurative art. These include Robert Campin’s Annunciation Triptych (Merode Altarpiece, 1427-32), a Cezanne picture of three bathers and an Utamaro print of a graceful courtesan mopping her brow. 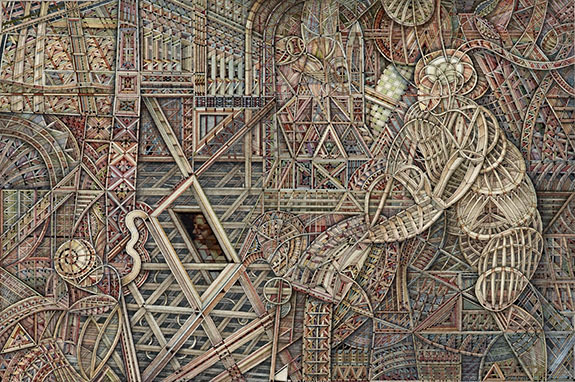 Rendered in watercolor, Di Mare’s incredibly elaborate geometric patterns suggest intricate wooden constructions — possibly the interior ribbing of boats – in shallow space. Only one such piece is accompanied by a reproduction of the work on which it is based, but if you consult the accompanying 176-page book (beautifully illustrated with a meticulously researched essay by Mayfield), you can see all of them, and compare Di Mare’s interpretations to their sources. Artist’s books represent Di Mare’s most recent efforts. In these, layers of drawing, delicate cutting and prismatic watercolor, partially visible through openings in pages, hint at wonders that (sadly) remain unrevealed. An iPad next to the case of books seems as if it is intended to show the turning of the pages of at least one book, but it wasn’t working when I visited. Exhibiting books is always difficult, which is why museums sometimes turn pages partway through a show. Di Mare, now 86, shows the same determination to continue towards the next stage of his work, exploring a personal language and mythology so rich and evocative that he will seemingly never run out of inspiration and ideas. Dominic Di Mare: “Anchors in Time” @ Museum of Craft and Design to October 28, 2018. The 176-page book "Anchors in Time: Dominic Di Mare" is available at the museum and from Fine Arts Press.